A Wall Shelving Store Displays Section includes one Basic Upright with Cap, one Base Shelf, one Kickplate, one Back Panel and one Top, Center, and Lower Spanner. If the Gondola is 78" tall or taller, the section would also include one Splicer Spanner. A Gondola Shelving Store Displays includes one Basic Upright with Cap, two Base Shelves, two Kickplates, two Back Panels and one Top, Center, and Lower Spanner. If the Gondola is 78" tall or taller, the section would also include one Splicer Spanner for two piece backs. This 4-Way Shelving Store Display is a versatile fixture that gives maximum exposure to impulse items. Panel frames are slotted to accept all Madix Standard Shelves or accessories. The Laminated or Carpeted Deck is 5" high, plus the deck has 'T' mold edge to match kickplate. Four Way Island, I Shaped, H Shaped, and T Shaped wire grid island type displayers for all types of merchandise. Spinner displays are effective in small retail stores that do not have a lot room. This Freestanding Slatwall Display is perfect for the presentation of clothing on hangers using Madix Slatwall Hangar Arms and Slatwall accessories sold separately. Also an excellent displayer for other types of merchandise. Currency counters for all types of business from Bank and Casino to convenience store and restaurant bill and coin counting. If your business handles lots of cash on a daily or even a weekly basis you might want to consider a currency and or coin counter for accuracy and time saving. 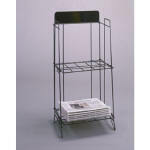 News Paper Racks for Broad Sheet, Quarter Fold, Magazine and more.